When we start developing an Arduino project usually we tend to use the Arduino IDE. There are, anyway, several Best Arduino IDE alternatives we should consider if we are not satisfied with the standard IDE. As we know, Arduino is one of the most popular prototyping board (with several alternatives) when it comes the time to develop an IoT project or when we are building a DIY project. In this article i mention some Best Arduino IDE alternatives. 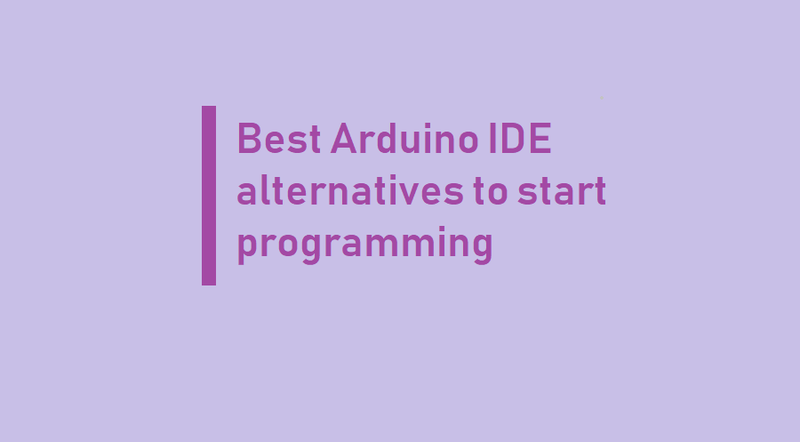 This article wants to provide a list of Best Arduino IDE alternatives you can use when creating your Arduino project if you do not like the standard Arduino IDE. The order is random. PlatformIO is independent of the platform, in which it is running. In fact, the only requirement is Python, which exists pretty much everywhere. What this means is that PlatformIO projects can be easily moved from one computer to another, as well as that PlatformIO allows for the easy sharing of projects between team members, regardless of operating system they prefer to work with. Beyond that, PlatformIO can be run not only on commonly used desktops/laptops but also on the servers without X Window System. While PlatformIO itself is a console application, it can be used in combination with one’s favorite Cloud & Desktop IDE or text editor such as PlatformIO IDE for Atom, CLion, Eclipse, Emacs, NetBeans, Qt Creator, Sublime Text, VIM, Visual Studio, VSCode, etc. This is a plugin for Eclipse. Eclipse well known IDE. It is almost a standard in the IDE. Eclipse is a very versatile environment that supports several programming languages ranging from Jave to C/C++ and so on. This platform uses the plugins to extends its features and add new platform support. This is a plugin for Eclipse IDE that helps to develop Arduino applications. You can download the plugin directly from the Eclipse Marketplace. Of course, it is required you install first the Eclipse C++ IDE. Once, this plugin is installed in Eclipse IDE, you have to select the platform or in other words the SDK that includes all the libraries necessary to build the application. Once the plugin is configured, you are ready to develop your Arduino sketch. The IDE is essentially the Eclipse IDE so if you are familiar with Eclipse you do not have problems to use it. This Arduino IDE has all the features you have in the standard Arduino IDE such as Serial monitor to debug the Arduino sketch too. Sloeber a free, open source, Eclipse IDE to ease your development efforts! This represents a completely free and open Arduino IDE alternative! Moreover, Sloeber supports several prototyping boards. embedXcode is a template for Xcode, Apple’s official IDE on macOS, and eases development for the most popular embedded computing boards. The embedXcode template comes in two editions : embedXcode standard edition with core features, and embedXcode+ edition with extended functionalities. This is a free Arduino IDE developed for Mac OS X. This IDE supports syntax highlighting, line numbering and so on. This IDE simplifies the Arduino sketch development using a smart environment that assists you during the development. This IDE can be used with several prototyping boards such as Arduino, ESP32, ESP8266, Adafruit and many boards. embedXcode has different versions and licenses. There is a free version that supports the basic features while if you want to unlock all its features you should consider embedXcode+ that requires a license. This is a plugin for Microsoft Visual Studio. This Arduino IDE is fully compatible with Arduino. This IDE helps you to write Arduino code easily and fast with syntax highlighting, code error hints and so on. It supports several Arduino boards so you are free to select your board to write the code. It is very easy to use because it exploits the Visual Studio features so you have an integrated environment where you can write the Arduino code. It supports Serial debug and it is possible to create charts. Another interesting feature is the capability to use Arduino libraries. Visual Micro Arduino IDE fully supports the Arduino library format and you can add it to your Arduino code easily using the Library manager. This is a professional platform. Studio 7 is the integrated development platform (IDP) for developing and debugging all AVR® and SAM microcontroller applications. The Atmel Studio 7 IDP gives you a seamless and easy-to-use environment to write, build and debug your applications written in C/C++ or assembly code. It also connects seamlessly to the debuggers, programmers and development kits that Support for 500+ AVR and SAM devices. The app takes about 210Mb as it contains IDE, compiler and uploader. Make sure you have enough free space in internal storage and it can’t be installed on sd card because of Android security policy. It runs on Android devices and using it you can program your Arduino. This is the first IDE that runs on Android OS. It is worth mentioning because it helps you to write code using an Android device. It supports several Arduino boards. I hope you like this post Best Arduino IDE alternatives.